Johh Podesta was Bill Clinton’s chief of staff and aided in Obama’s transition into the White House in 2008. He is also known to be a sci-fi enthusiast, and has been involved with efforts to get the government to disclose all it knows about the UFO phenomenon. His UFO interests have made headlines this week after a story on the subject was posted by Huffington Post reporter Lee Speigel. Podesta served on Clinton’s staff from 1993 until Clinton left office. His final position was as Clinton’s Chief of Staff. He has remained influential in politics through a liberal think tank that he founded called the Center for American Progress. It has always been known that Podesta is a big sci-fi buff. He made headlines during his tenure in the White House when he had an X-files themed birthday party. He was especially keen on that TV series. For a man at his level to have an interest in sci-fi is not that unusual. However, the depth of his interest in UFOs was revealed when he spoke at a press conference at the National Press Club asking the government to release its secret files on UFOs so that scientists can determine the nature of the phenomena. In 2002 the Coalition for the Freedom of Information headed by journalist Leslie Kean, along with the Sci-Fi channel (now SyFy), held a press conference at the National Press Club in Washington D.C. to address the issue of secrecy regarding the subject of UFOs. 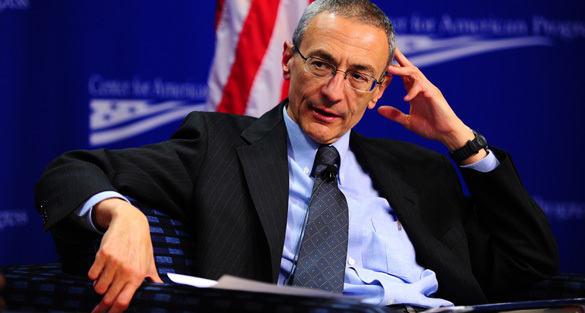 At that meeting Podesta stated, “It is time for the government to declassify records that are more than 25 years old, and to provide scientists with data that will assist in determining the real nature of this phenomenon.” He made this comment in front of several major media representatives in attendance. The video can be seen below. Freedom of information was a major concern for the Clinton administration. In fact, Podesta was in charge of a project to declassify millions of government documents. Did Podesta not find the UFO documents he was looking for in those stacks of declassified files? We do know that Podesta was not alone in the Clinton White House when it came to searching for the truth behind the UFO mystery. Read more here. Oh also the files on Majestic, Freemasons, and the Illuminati would be great too!